Rnd 3: Join color A with sc in first ch-2 sp, ch 6, (sc in next ch-2 sp, ch 6) around, join with sl st in first sc. Rnd 5: Join color C with sc in first st, double love knot (see dlk tutorial) skip next 3 dc, (sc in next dc, dlk, skip next 3 dc) around, join with sl st in first sc. Fasten off. Rnd 6: Join color A with sc in center sc of first dlk, ch 6, (sc in center sc of next dlk, ch 6) around, join with sl st in first sc. Rnd 7: (Sl st, ch 3, 7 dc) in first ch-6 sp, 8 dc in each remaining ch-6 sp around, join. Fasten off. Rnd 8: Join color D with sl st in first st, (ch 5, dc) in same st as joining, ch 1, skip next 3 dc, *(dc, ch 2 dc) in next st, ch 1, skip next 3 dc; repeat from * around, join with sl st in 3rd ch of ch-5. Rnd 10: Join A with sc in 4th ch-1 sp (the center ch-1 sp of first fan), ch 5, dc in next sc, ch 5, (sc in center ch-1 sp of next fan, ch 5, dc in next sc, ch 5) around, join with sl st in first sc. Rnd 11: (Sl st, ch 3, 5 dc) in first ch-5 sp, 6 dc in each remaining ch-5 sp around, join with sl st in top of ch-3. Fasten off. Rnd 12: Join color E with sl st in first st, (ch 2, 2 dc cl—see Special Stitches) in same st as joining, ch 3, skip next 2 dc, (3 dc cl—see Special Stitches-- in next st, ch 3, skip next 2 dc) around, join with sl st in top of 2-dc cl. Fasten off. Rnd 13: Join color A with sl st in first ch-3 sp, (ch 3, 2 dc) in same sp as joining, 3 dc in each remaining ch-3 sp around, join. Fasten off. Rnd 14: Join color B with sc in first st, dlk, skip next 3 dc, (sc in next dc, dlk, skip next 3 dc) around, join. Rnd 15: Ch 3, sc in sc at center of first dlk, dlk, (sc in sc at center of next dlk, dlk) around, join with sl st in first sc. Fasten off. Rnd 16: Join color A with sc in sc at center of first dlk, ch 6, (sc in sc at center of next dlk, ch 6) around, join. Rnd 17: (Sl st, ch 3, 5 dc) in first ch-6 sp, 6 dc in each ch-6 sp around, join. Fasten off. Rnd 18: Join color C with sl st in first st, (ch 5, dc) in same sp as joining, skip next 2 dc, *(dc, ch 2, dc) in next dc, skip next 2 dc; repeat from * around, join with sl st in 3rd ch of ch-5. Fasten off. Rnd 19: Join color A with sc in first ch-2 sp, ch 1, (2 dc, ch 2, 2 dc) in next ch-2 sp, ch 1, *sc in next ch-2 sp, ch 1, (2 dc, ch 2, 2 dc) in next ch-2 sp, ch 1; repeat from * around, join with sl st in first sc. Fasten off. Rnd 20: Join color D with sc in first ch-2 sp, (3 dc, ch 2, 3 dc) in next sc, *sc in next ch-2 sp, (3 dc, ch 2, 3 dc) in next sc; repeat from * around, join with sl st in first sc. Fasten off. Rnd 21: Join A with sc in first ch-2 sp, (4 dc, ch 2, 4 dc) in next sc, *sc in next ch-2 sp, (4 dc, ch 2, 4 dc) in next sc; repeat from * around, join with sl st in first sc. Fasten off. 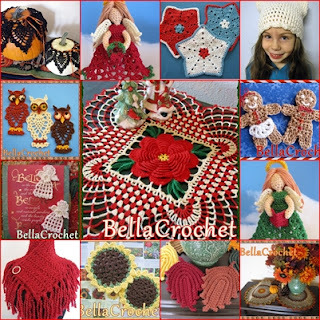 Rnd 22: Join color E with sc in first ch-2 sp, (ch 3, sc) in same sp as joining (beginning picot made), ch 3, sc in next sc, ch 2, 9 dc in next ch-2 sp, ch 2, sc in next sc, ch 3, *picot (see Special Stitches) in next ch-2 sp, ch 3, sc in next sc, ch 2, 9 dc in next ch-2 sp, ch 2, sc in next sc, ch 3; repeat from * around, join with sl st in first sc. Fasten off. 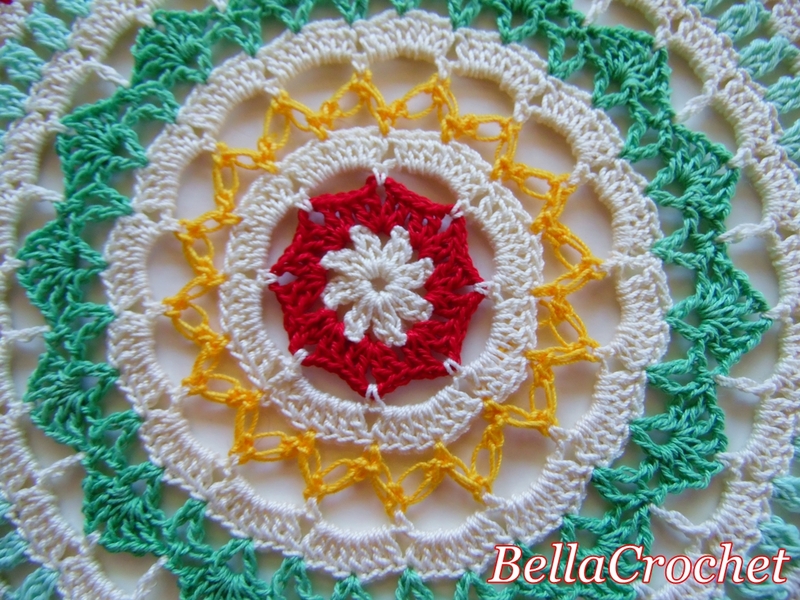 Rnd 23: Join color A with sc in ch-3 sp of beginning picot, (ch 3, sc) in same sp as joining (beginning picot made), ch 1, (dc in next dc, ch 1) 9 times, *picot in ch-3 sp of next picot, ch 1, (dc in next dc, ch 1) 9 times; repeat from * around, join. Fasten off. Rnd 24: Join color B with sc in ch-3 sp of beginning picot, (ch 3, sc, ch 5, sc, ch 3, sc) in same sp as joining, skip next ch-1 sp, sc in next ch-1 sp, (ch 3, sc in next ch-1 sp) 7 times, skip next ch-1 sp, *(sc, ch 3, sc, ch 5, sc, ch 3, sc) in ch-3 sp of next picot, skip next ch-1 sp, sc in next ch-1 sp, (ch 3, sc in next ch-1 sp) 7 times, skip next ch-1 sp; repeat from * around, join. Fasten off. Special thanks go to Jewel Fernley, Jolene Ortiz, and Rosina Smith for testing this pattern. I don't know what I would do without my awesome testers!!!! 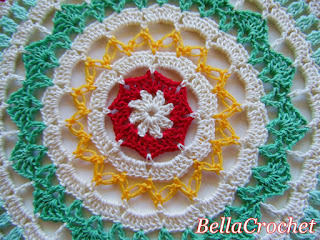 another lovely mandala pattern: thank you!